Kasuya T. & Kobayashi T. (2011) Revision of some Japanese Crepidotus: A new species, a new record and type studies of two species described by Sanshi Imai. Crepidotus byssinus is described as new from warm-temperate area of eastern Japan. It is placed in the subgenus Dochmiopus, section Dochmiopus, series Caspari and is morphologically similar to C. caspari var. caspari. Crepidotus calolepis var. calolepisis reported as a new record from warm-temperate broad-leaved forests of Honshu, central Japan. Type specimens of C. badiofloccosus and C. longistriatus, both originally described from Hokkaido, northern Japan, were reexamined. Based on the morphological features, C. badiofloccosus is confirmed as a synonym of C. crocophyllus. Crepidotus longistriatus, a morphologically poorly known species, is revealed as the distinct species belonging to the subgenus Dochmiopus, section Sphareuli, series Applanatus. Descriptions, illustrations and discussions of these species are provided. 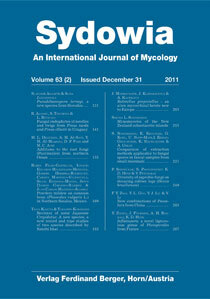 Keywords: Cortinariaceae, mycobiota, new synonymy, wood-inhabiting fungi.